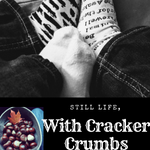 book review | Still Life, With Cracker Crumbs.. I love to read Mary Kay Andrews. Always a great warm weather location, interesting premise, and madcap, zany characters. I first started reading her when I found the Savannah Blues series, and haven’t stopped. When I received a free review copy from St. Martin’s Press via NetGalley, I was so excited! I was feeling a bit down and out over this everlasting, non-stop winter we seem to be experiencing in Michigan, and I needed a bit of a Vitamin D boost, even if it was vicariously through fiction. At first, it was not quite what I was expecting. Not quite as madcap and zany, there was a different tone right from the start. Poor Drue was going through one of the lowest moments of her life, losing almost everything in her life all at once. Her estranged father shows up to her mom’s funeral with an offer she thought she could refuse – until the rest of her world came crashing down, like the kite board that rendered her injured on top of everything else. Drue reluctantly accepts the offer, which was sweetened by the prospect of living her in Noni and Popi’s cottage on the beach, where she had spent many a happy summer. The cottage needs some work, but in the beginning, so does Drue. I have to be honest – Drue kind of bugged me at first. She was a bit whiny, had a bit of a chip on her shoulder, and while I guess in part it was a well-earned one, she didn’t seem to be swayed by her father’s attempts to reconcile their relationship, and it just seemed sort of…bratty. And this character was over the age where that is acceptable. However, Drue’s wall starts to come down, and as it did, she was a much more likable character. Perhaps this was intentional by the author, for us to meet her in such a bad place, at less than her best, then see how she blooms as she heals. Judging by just the cover, I expected a lot more beach time romance, and while there was a bit of romance, there was a lot more depth to this story as well. While working for her father’s law firm, Drue is drawn into two unsolved murders – one from more recent times, and another from 1976. The more I read, the more fascinated I was. There were a lot of layers to unwrap in both of these mysteries, and I loved when a new clue was dug up by Drue, who went to any length to find out the truth. All in all, a bit of a slow start for me, but really picked up in the end. I didn’t want to put it down. I hope that Andrews writes more books involving these characters, as I feel that Drue has more adventures ahead of her! I always love when my reading takes me to the world of Sullivan’s Crossing, in Timberlake, Colorado. There is just something so real about these characters, and I have enjoyed reading about their challenges and triumphs in the previous novels. This installment was no different, I finished it in one day, a record for me these days! Leigh Culver has settled into the community of Timberlake comfortably, healing their hurts in her clinic, sharing stories and hellos in the pubs and restaurants, slowly making friends and inroads into this friendly community. Her life seems to be just how she wants it, with the exception of missing her beloved aunt, who raised her. When a white-faced Rob Shandon, owner of the town pub, comes in one evening with his injured son, little does she know that her world is about to change in a big way. After stitching up Rob’s son’s hand, she finds she has a new patient, Rob himself, who almost faints at the sight of the blood. Leigh capably calms him down by massaging his head, something she does for patients who need some help slowing down, and boom – fireworks for Rob, immediately. Their quick friendship turns into a relationship even quicker. Spring has definitely sprung in Colorado, and love is in the air for everyone. With spring in full bloom, Leigh’s aunt Helen comes for a visit. Helen is a popular mystery writer, and spends her time visiting different friends spread out through the U.S., avoiding midwestern winters like the plague. Helen is planning on spending much of her time with Leigh, but finds herself drawn to the front porch and kitchen table and eventually bedroom, of someone special herself. But like Shakespeare said, the course of true love never did run smooth, as many of the couples in this book go through their share of hurdles. From Finn’s story with his girlfriend Maia, to Leigh and Rob, to Helen and her new love, all must find their way and their path to that true happiness. I loved Leigh’s story with Rob, although, I do have to say I have to give it to Rob in this book. Leigh was a little difficult at times, and a little selfish, and I felt Rob’s character remained strong and steadfast and loyal, qualities that are also reflected in his son Finn. I loved the Shandon family, I have to say, in this book. All in all, this was a great read from start to finish, and one to shake off those winter blues! Giveaway! For a chance to win a brand new hardcover The Best of Us, just leave a comment below! I’ll do a drawing next Wednesday, Jan. 16th. Open to U.S. residents only, sorry! Thank you to Little Bird Publicity for the chance to read and review this book! I was given a review copy in exchange for an honest review. This book was the perfect start to a holiday reading season line up. It’s not a Christmas book, although, Christmas movies of the Hallmark sort are talked about! It was a fun, easy read about starting over and reconnecting with the “one that got away”. I thought Aiden’s character was great – a real hero, the epitome of what a sheriff of a small town should act like. Returning to Honeymoon Harbor from a stint in the military and then as a cop in LA, he finds that being a sheriff of the town he grew up in suits him. He cares about his community, the people he serves, and despite the fact that he used to be a big city detective, he takes his new position very seriously. He is a family man, cares about animals, and is just a good guy. His past haunts him however, both in his professional life and the memory of the rebellious boy that he used to be, and he has some demons to work through and figure out. Jolene is a bit too blithe for me, or lacking something. I had a hard time connecting with her character – she didn’t seem to care much about some major things that happened to her at the beginning of the book, and it was kind of weird. She, like Aiden, is returning to Honeymoon Harbor after a long time living away, to be with her mother during a health scare. She is on the brink of beginning a new chapter in her career life as well, and is able to use her time back home to gather what she needs and really think about her options. The two find that their connection is just as strong as ever, and can’t be denied. Both have ties to their past still lingering, and must deal with these issues as well. Honestly, that is my only complaint about this book. I felt that there were way too many threads and plot lines going on – I think it really watered the book down a bit. Had there been fewer, Ross would have been able to really flesh out the ideas that were left. As it was, I felt some of the issues were a bit throw away, and when they would pop up I would be like, “oh yeah, I totally forgot about that”. Otherwise, this book is a good solid read to put you in the holiday spirit without going overboard before the holidays, if you are waiting until after Thanksgiving to dive headfirst into the winter holidays. It is not a Christmas romance, but they do celebrate Thanksgiving! Thanks for Little Bird Publicity for the chance to read and review this fun holiday read! I received a complimentary review copy from Little Bird Publicity in exchange for an honest review.